What’s that sound? It’s you, moaning and holding your aching abdominals after a tough training session. But don’t look around for the yoga mat or infomercial device. We’re working the abs they way they should be worked—by battling gravity! Each of our muscles does something—stop me if I’m going too fast for you. Taking your biceps as an example—because I know you’ve been waiting for your biceps to be taken as an example—their primary function is to bend the elbow. To train them according to conventional wisdom, you add resistance to make it harder for the biceps to bend the elbow. Voila: the biceps curl. Likewise, your calves flex your foot at the ankle (think about flooring the gas pedal); a weighted calf raise makes that harder to do. That’s only one side of the story, though. Every muscle also works to keepsomething from happening. Your biceps, for example, are anti-elbow-extension; if they weren’t, your arm could snap just handing a business card to someone. Your calves are anti-dorsiflexion. If not for their diligent work, the top of your foot would smack against your shin every time you took a step. From a training perspective, these anti-functions are one of the reasons to lift with steady pace and controlled form—aside from not getting injured, of course. They’re why the eccentric (lowering) portion of the bench press can be a great biceps exercise, and a barbell curl can roast your triceps. This applies to your core muscles as well. You’ve been performing your rectus abdominis and obliques’ primary functions since the first time you did a sit-up,crunch, or side bend. And yes, this does make them work. But every year, the chorus of coaches and trainers telling us to train the opposite way gets a little louder. “Work your core by making it struggle against gravity!” they scream. It’s time you listen to them. You don’t have to abandon crunches forever, but you can have your visible abs, as well as stronger and more functional abs and a healthier back, by putting your focus more squarely on what you could call “anti-ab training.” You may also notice a few other improvements, such as a stronger grip and the ability to wrestle bears on a mountain. An abdominal crunch is a spinal flexion movement performed by your rectus abdominis. That means the top portion of the spine rounds or bends forward, coming closer to the pelvis on the anterior side. But that is only part of what your abdominals do, and I argue it’s the least important part. The motion your rectus abdominus keeps from happening is far more important. Your abs function like the supporting structures on a dam. We are capable of producing tremendous forces through hip and spinal extension. Imagine a heavy deadlift, or people who unexpectedly lift cars off their loved ones in parking lots. Half of this movement is performed by the powerful muscles in your back pulling your vertebral column upward. However, if there was nothing to counteract this force, we would simply bend ourselves backward into a horseshoe anytime we did something as simple as lifting a suitcase. For stability, we need to be able to counteract those forces on the other side of the joint, which is precisely what our abs do. At the risk of starting an impromptu debate on intelligent design, I would argue that the rectus abdominis muscles are actually meant for anti-extension, rather than spinal flexion. After all, how often do you perform active crunch-like motions outside of the gym? Probably not very often. However, anytime you pick something up off of the ground, walk with a load in front of you (this could be a bag of groceries, a child, a chainsaw, or all three at the same time), or lift something overhead, your abdominals actively work. To emphasize this point, grab a 25-pound weight and hold it at arm’s length. Move it around a little bit, maybe from side to side or overhead. As you do so, notice how strongly your abs contract. As much as you feel the burn when doing your normal ab exercises, this is how to actually make then stronger and work them harder. 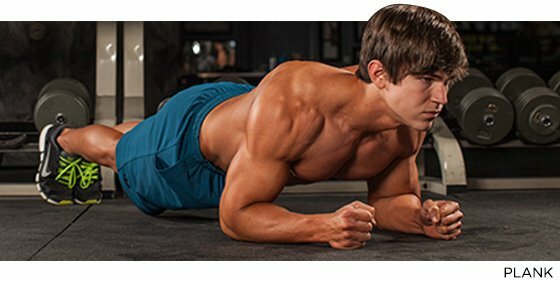 A study published in the March issue of theJournal of Strength and Conditioning Research backed this up, concluding that the rectus abdominus and obliques were more activated during movements that had an anti-flexion or stability components, than during simple ab isolation movements like the crunch. One of the best things the crunch has going for it is its simplicity. All you need is a bit of floor space, after all. But effective anti-ab training doesn’t have to be complicated or equipment-specific. It can be as simple as going heavy with free weight movements you already do—or should do. You might also try some new and painful bodyweight maneuvers, or use a familiar implement like a dumbbell in a new way. No matter how you do it, ensuring that you hit the three areas of training below will cover your abdominal needs, whether it’s your transverse abdominus, rectus abdominus, or obliques. Work them into your program for a few months, then check back for a quick punch in the gut, and tell me you’re not stronger. I have a shirt hanging on the wall next to my desk that says “It’s not a big belly—it’s a thick waist.” OK, sometimes it’s both, but the point is athletes such as powerlifters and strongmen have thick trunks. The back of someone who can squat and deadlift 700-800 pounds needs to have substantial spinal erectors and multifidi, two muscles which lend themselves to a larger waist size. However, in order to avoid snapping their spine in half, heavy lifters also need the opposing muscle groups to be just as strong. You may have legs and a back that can hold a car, but if your abs aren’t strong enough, you’ll be crushed like a worm. Plenty of strong men have built up their anti-flexion strength using direct ab work, but most of us can get what we need from picking up and carrying heavy things, particularly in front of the body. A new review study in the latest Journal of Strength and Conditioning concluded that multi-joint free-weight exercises with heavy loading work the core more heavily than any direct ab work. I add that the most ab-intense movement I have ever done is the Conan’s wheel for a strongman competition. Sandbag and keg carries will work in a similar fashion. So find something heavy, hoist it, and go for a walk! Doing your overhead work standing will help those abs stay involved, as any Olympic lifter will tell you. Every program should include things like planks or side planks, push-ups, and mountain climbers. There’s a good reason these are becoming the go-to movements in more and more ab routines: They work! As you struggle to maintain a straight line from your head through your hips, you run your rectus abdominus and other core muscles through a gauntlet that a simple spinal flexion movement just can’t match. For a new approach, include suspension movements like fallouts, either on a TRX-style trainer or furniture moving pads. Even foam rolling (something you should be doing anyway) can provide a significant training load for your abs. Many of the positions used are essentially planks or other anti-ab work anyway, so why not kill two birds with one stone? The primary functions of the obliques are twisting the spine (spinal rotation) or doing side-bends (lateral flexion and extension). But your rectus abdominus functions better for anti-extension, so the obliques are stellar at counteracting the forces of rotation and lateral bending. To train anti-bend-me-in-half-sideways power, the best movements are asymmetrical lifts like the one-arm farmer’s carry or the suitcase deadlift, where you pick up a dumbbell, kettlebell, or—if you’re really looking for a good time—a loaded barbell off the ground on one side. To train anti-rotation, move to the cable station and try any of the varieties of the Pallof press, either standing, kneeling, or half-kneeling. This entry was posted in Body Shapers and tagged Abdomen, Crunch (exercise), Physical exercise. and your blog is great…u r doing a great work..